I have just received the below..? I'm very sorry! My two year old daughter got ahold of my iPhone and sent that. 91. when my husband and kids walk me to the car. 92. my mom's voice every weekend, especially when I'm on the other side of the world! 96. knowledge that with random events comes Gods faithful guiding hand 97. including missing baggage delivery in airports, avoidance of strange weather in a cross country drive, baby's first fever while parents are away. 98. Brown eggs in Vietnam, my dad loved brown eggs, it's familiar. 101. Clean bathrooms with soap and disposable towels! 104. SKYPE, while I'm in Asia. 106. new friends who care about my safety and well being. 108. comfortable walking shoes that last for years and still look professional. 109. for Sunny, who is a Christian woman and teaches me to be gentle and kind. 113. a quiet reminder to refill my phone card (is it from God?). I like to think so, especially when it means a call to my husband later and otherwise would have been out of time. 114. a Hong Kong office with some of the nicest caring people, I can be very thankful for this because there were many years I traveled with very little support. 118. that my old breast pump lasted up to the minute my new pump arrived, shipped to me by my husband from the other side of the world 2 days prior when I said it might be breaking, better send a new one. What a miracle!! 119. it is well with my soul, it's true, after listing thanksgivings it really is well in my soul. 122. a husband willing to drive the family on cross country trip. 123. answers to prayer, especially for a family crisis in which 2 year old is constipated on cross country trip. I am not amused by your sudden burst of hyper activity and refusal to breast feed at 10pm for two nights straight!!! This behavior is alarming and must cease immediately!!! Hurray for Random Tuesday, a super cool place created by Keely @ "The Un Mom", head over and check out the coolest graphics in the bloggisphere! In my job, I have a giant pile of work. Within this pile, I must seek out the most urgent issues requiring my attention and devote myself to these items. If I were a congressman I'd do the same. So when I hear of Republican Rep. Doug Lamborn proposing a bill to cut funding to NPR I have to scratch my head and wonder WHY is he prioritizing this bit of work??? In the three weeks I've been to Asia GAS has risen $0.25+ per gallon! This is particularly galling considering the root of the problem is evil speculators on Wall Street. Where is the regulation congressman??? The war with Libia is only a few weeks old, oil is already processed and sitting in containers ready to be distributed and yet evil speculators have the power to jack the price up on oil already bought and processed just waiting to be distributed to gas stations??? Priorities government! In less outrageous news, a study has been done on Birds VS Cats! This article points out the helpful statistic that cats are the number 1 killer of birds!!! I'm shocked. I thought cats just laid around and ate dry cat food. The American Bird Conservancy estimates 1/2 a million birds are killed by cats every year. I'm still Team Cat. * In my own tiny garden, 2 orchids are blooming along with a favorite amaryllis - and this plant blooms like clockwork every spring - note this post from last April! From this burst of growth came a burning ambition to freshen up the house. So we cleaned the fans, cleaned out the refrigerator, reupholstered 3 chairs for evening dining on the porch, put a coat of beeswax on outdoor table, put a coat of linseed oil on outdoor chair and painted the top of TV stand that Charlotte had previously decorated with pen and stickers. What a fun day!!! We never made it to Shreveport yesterday. Sam started crying hysterically at 10pm so we spent the night in Tyler, TX. We had a miserable time getting him to sleep; he had slept all day in the van and was wound up tighter than I’ve ever seen him. To make matters worse the hotel didn’t have a crib or playpen. We were so tired we thought we could try a make-shift bed with a drawer covered in blanket but he had on room to turn over so he got more upset. We ended with putting him between us in the Queen size bed and he rolled between us all night. I don’t get co-sleeping, it was the most distracting night of my life. New rule – hotel must come with crib or playpen from now on. Only aiming for La Quinta Inns at this point! We all woke up at 7:50, left hotel by 9, had breakfast at Cracker Barrel and on the road by 10:15am. It’s been a fairly pleasant day, kids are both broken in and dealing with the all day ride very well. Currently the time is 4pm and we are still in Louisiana. Still 15.5 hours from home!!!! After a tense 1.5 hours in line, not a long line just slow, I finally got processed to take my regularly scheduled flight to Japan which routes me back to Dallas. I don't think arriving any sooner would have helPed, info just came in late on Japans airport status. About to leave Japan, should be back in US in 12 hours! Breast pumping in strange bathrooms on airplanes, in factory bathrooms, scheduling it in between all day meetings but the absolute worst is our own factory bathroom! Linking to awesome working mom blogger Julia @ Work, Wife, Mom, Life, this weeks prompt is: How do you stay current in your area of expertise? Innovation - it's what all our clients request, every year, every meeting they want a little thing called innovation! Well it would be a super attractive fabric for a plush toy that has never been done before and is gorgeous, cheap (sorry I mean affordable) and is just simply amazing!!! We nod our heads as if to say I have just the thing back at the office, prepare to be amazed. In reality we run straight to the stores/boutiques and check out what all the high end plush dealers are doing these days. Gund, Jelly Cat, Douglas Plush Toys, TY, etc and we copy them - okay it's not quite that easy. We simply look for inspiration. 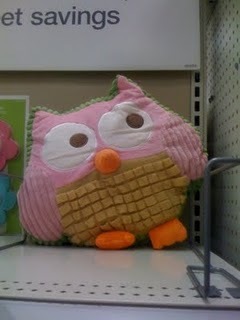 Last year the plush world was abuzz with this plush owl cushion at Target because it is just so darn creative. But I haven't seen anyone successfully clone it because what works for this beautiful piece does not necessarily work for other characters. My big success last year was this Paisley Pooh Collection, I designed the background fabric print myself! It's sold exclusively at Walt Disney World. So here I am in Asia, looking to find new materials, new ways of doing things - looking for that elusive innovation. When I find it I'll let you know! Hurray for Random Tuesday, a super cool place created by Keely @ "The Un Mom", head over and check out the coolest graphics in the bloggisphere! She makes me want to read comic books and dream about Maple Syrup (which is sadly missing here in Asia). In the airport, I stand in customs line and observe a father and son. The boy is Charlotte's age and sleeping on his dad who puts him down to rearrange his backpack. In this exchange the boy wakes up and demands a bottle. He raises it high to drink. I ask the dad if I can take his picture and he nods yes with a huge smile, as I aim the camera the little boy gets very angry and hides behind his dad. Sorry I say, no photo today. He climbs back in his dads arms and eyes me suspiciously. My driver is 10 minutes late, I freak out, text my boss & director of ops while dialing the factory manager before he shows up and directs me to stand outside while he gets the car. It's only my 3rd time here, don't laugh, I wanted to see a sign with my name on it!!! On the drive there are endless rice fields to observe. There is beauty in vast fields of rice that have not been industrialized and paved over. I suppose it's only a matter of time. Our company is already building a 2nd factory and spending several months to pave over a rice patty. Apparently it takes quite a bit of effort to fill in a watery patch of land. I notice communities of people gathered at the edge of rice fields, an impromptu game of football (soccer) breaks out. Families bury their ancestors on the rice patties, a little shrine sits in a corner. Along the drive I even see shrine dealers, similar to what you might find in the US when shopping for grave stones. Motor bikes (scooters) ride down raised hills between rice patty squares. I wonder, how do they keep track of which rice patty has been raked last? These fields are so vast! Old ladies bent double from years of working the rice fields. Cows wander in and out of patties, up and down embankments, right up to the road to graze aimlessly. I wonder who guides them back to shelter at night? They seem quite independent but with tags. So what do I like most about Vietnam? The fruit! The mango's are so good! My dinner is a stir fry with mango sauce, shrimp, cashews and fresh veggies. What a lovely dish! Better food than my Hong Kong hotel, but less independence here. Not that it really matters, I'm in for the night. Finally, today is International Woman's Day! The factories workers (predominately women) left at 5pm to celebrate (usually leave by 6). All along the roadway were flower sellers with huge gorgeous bouquets in heart shapes, our R&D room had several deliveries of flowers from the factory manager. What a lovely celebration!! Several years ago, I "met" Grit through her blog about home schooling triplets. I've followed their escapades from the UK through their move to Hong Kong last August. I sympathized as they suffered through the humid summer (we have the same weather in South Florida) and said to myself if I ever get to Hong Kong, I'm definitely going to hang out with this adventurous clan. Well - we finally managed to cross paths this weekend! A flurry of emails, confirmation of meeting point and shared mobile numbers got us to Pier 7 on Hong Kong harbor side. Thankfully we had the foresight to share phone numbers because at the pier I went up and she went down to street level. It took 15 minutes of discussion - I'm at the Starbucks, I'm on the path, I'm street level - wait what does that mean, oh look here's a Gritlet (nickname for one of the triplets) running up to me with pink pants! Cue awkward introduction, hi Squirrel (her nickname, although I'm not sure if her mom calls her by this name or if it's just on the blog), I'm a friend of your mum's, where is she by the way? She just stares at me like I'm an alien and runs off, assume I'm to follow. Shortly thereafter I see happy Grit waiting for me at the bottom of the stairs. Introductions are made to husband and the three triplets and we head up to The Peak of Hong Kong. Not sure how I've managed to miss this in my prior 8 trips here but it's a stunning view of Hong Kong - on a clear day! We managed to get our heads stuck in the clouds and observe some hazy buildings off in the distance. But I'm getting ahead of myself. On the bus, the Gritlets steer me to the top front because it has the best view - cool 11 year old tour-guides! They point out the mountainside grave yard along the way and I talk Grit's ear off about my job and God only knows what else. I'm just so giddy to spend time with real people on my weekend in Hong Kong. In prior trips I'd hole myself up in the hotel, sitting at the rooftop pool, reading books and feeling really depressed about being away from home. So this weekend with really cool people is just making me endlessly giddy. We make it to the top and my helpful tour guides take me straight to the bathroom. Afterward we re-group and the two hour hike begins - yes I was warned there would be a hike. I haven't read Grit's Day for 2+ years to not realize there would be some major form of healthy exercise involved! I find myself desperately trying to keep track of the girls real names and failing miserably. Their names are Shark, Squirrel and Tiger on Grit's blog and I don't want to call anyone by their nickname. Actually, when I first phoned Grit I managed to yell into the phone GRIT! I mean ______ insert real name - embarrassed laugh. This hanging out with new friends is a bit tricky - especially with my addled time-zone confused brain. Squirrel - description on Grit's Blog "Meet Squirrel. Lives in own world. Moving on from fairies to princesses. High maintenance daughter. If it doesn't come in pink or with added sparkles, it's probably not real." Along the walk I compliment her butterfly necklace and this leads to a lengthy discussion about her favorite butterflies and various pretty things. Her little fish purse is filled with useful odds and ends and she has a delightful bubbly personality. Shark - description on Grit's Blog "Meet Shark. Slightly opinionated. And blunt with it. Because basically, if you're not able to teach her about sailing, oceanography, marine life, you might not be worth knowing. She'll tell you that." While discussing butterflies with Squirrel, Shark turns the conversation to dolphins (I believe it had something to do with her only liking marine based jewelry). I mention the dolphins in Florida and they both explode into excited stories about the dolphins in Hong Kong, there is a baby one and a really fat one. Grit turns and see's me walking between the two girls and smiles. Shark seems to be in charge today, she's so full of confidence. Tiger - description on Grit's Blog "Meet Tiger. Beautiful, but deadly. Unstable temperament. Treat carefully. And do not get on the wrong side of these claws, because scars last a lifetime." Tiger ignores me completely and I understand she's not happy about the families residence in Hong Kong so I don't take it personally. She's an artist and we stop at the top so she can sketch the scenery. I wish I'd thought to bring my own pad, husband's been bugging me for ages to get back into sketching. I'll jump ahead to say the next day she finally offers to show me her sketch pad - this means the world to me. A break through! I'm thrilled beyond words because I understand what it means for artist to show off ones work. Somewhere during the walk I give up completely on figuring out names and just focus on each girls likes and dislikes. The entire family is just full of information and learning. I feel like I've spent the entire weekend at an education camp combined with lots of exercise! It's a good time, a really really good time and a welcome distraction from the loneliness of travel. So big thanks to Grit and her entire family for entertaining me all weekend. I'll never forget this. One of the great bonding things in travel is shared conversation about children, even when language is limited communication is still possible. In my hotel room the lady who delivers my laundry waits as I write out the ticket for today's load and notices my breast pump equipment. Baby? She say's, I smile and show her my baby's photo. She say's her's is 2 months old, smiles again. We part ways, both happy to have discussed our babies. Before going to sleep on Saturday night in Hong Kong I phone husband to see how he's getting along on his cross country drive to Texas. He's just reached New Orleans and has stopped for coffee and beignets at Cafe Du Monde. It's 11pm here, 9am there and he's about to get back on the road to drive on the 10. I go to sleep. I wake at 8am on Sunday morning, phone husband he's in Dallas. I read internet news and realize a tornado hit Rayne, LA at 10am which means at one point husband drove right through the aftermath. 16 hour work day - too long! Blame co-worker who meticulously went through 2 factories causing us to reach the 3rd at 5pm. We then spent 3 hours working and had to do the obligatory 2 hour dinner - at 8pm! Dinner was usual Chinese dishes - goose feet with mushrooms, green vegetables, crispy shrimp that had been cooked in their shell (apparently you are supposed to eat the entire shell), crispy chicken (meaning slices of chicken with thick crispy skin), beef with green beans, dumplings, soup and finally my request - Thai fried rice. I learned 5 years ago to always request fried rice for dinner. It's almost always eatable in a world of unrecognizable foods. I should have known it would go this way. 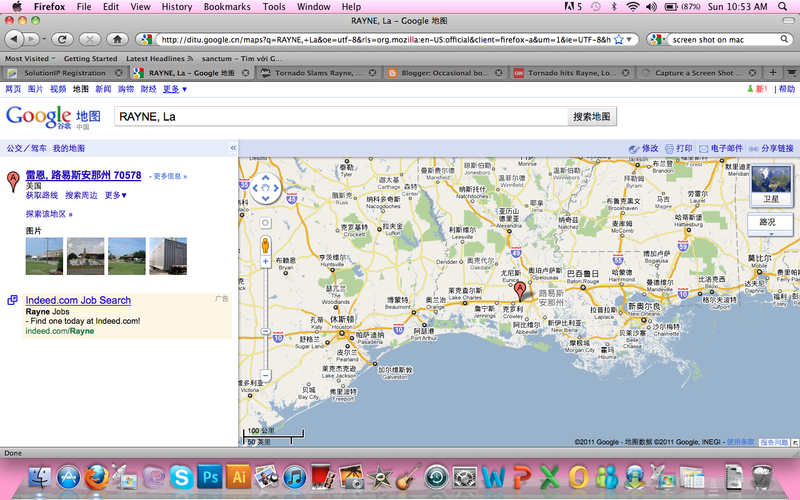 3 factories in one day is never an easy trip into China. Next time must bring contact case and glasses. 16 hours is a painfully long time to wear contacts. Now for a weekend relaxing in Hong Kong before 2nd grueling week starts. It would take me an hour to prepare this much variety at home. So while here, it's my favorite treat. My co-worker was like, why don't you come down for the buffet? I'm like, are you crazy? And miss sitting in my hotel bathrobe, eating custom breakfast and reading blogs? 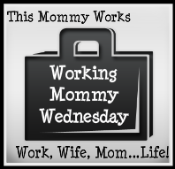 Linking to awesome working mom blogger Julia @ Work, Wife, Mom, Life, this weeks prompt is: Social networks- the good, the bad, and the ugly (your thoughts on social media). Currently on two week Asia trip and finding social networks to be a lifesaver for staying in touch with friends/family but also finding it banned in several countries. On Monday - Wednesday I was in Vietnam and got banned by day 2! Is like losing a limb to miss everyone's daily status! Must have become a huge part of my day - you know that part where I need a "mental break" and go check favorite websites. Finally in Hong Kong where all social networks have been restored. HK still operates independent of China and gives it's citizens more freedom then local Chinese. Friday going to China - expect no social networks for the day. Back to Hong Kong for the weekend. Then return to China next week Tuesday - Friday! No social networking for a week!!! Yikes!!! Will I survive on email? Will my blog work? I made it, but my luggage didn't arrive with me. There's a shock, we arrived to the airport with 2 hours before the flight and stood in the ticket line for 1.5 hours! So I'm here with no clothes (except what I'm wearing) in hopes they find my bag in that chaotic Hanoi airport and send it forward in the next flight tomorrow. Just had lunch at 4pm (plane food looked scary) and going to the office. Such is my glamorous international travel lifestyle. Jealous? Yeah I know you are. - While traveling I love to watch kids and how their parents treat their behaviors. For example, in Dallas airport, I watched a mom patiently try to council her toddler who was doing the exact same thing I've seen Charlotte do many times "MINE MINE MINE, GIVE ME THE CHIPS NOW"! And the parent was trying her hardest to teach the child that this negotiation strategy was unrealistic and completely improper. - Upon my arrival in Vietnam airport I again witness a defiant toddler who shook all the crackers out of the bag and into her lap/floor while angry mother buzzed/fussed/scolded the unrepentant child. I also observed the toddler rip off her pants in further defiance and was shocked to note no diaper! So do they basically potty train them as soon as they start walking here? Is it like, if you mess up you have to deal with it kid? I need to figure this out. Is it possible we spend too much time coddling our kids because we are so afraid of cleaning up more mess? The child then grabbed a water bottle and drank out of it, without spilling it on herself. How often do I still give Charlotte "safe" sippy cups and straws to prevent mess. This just might revolutionize my parenting! Could I honestly just remove diapers and let her figure out potty training on her own while cleaning up after her? We do have tile floors. Unconventional? Maybe, but think of the $40.00 saved every month on diapers. I know, I know, my delusional thinking is getting worse. It must be the spicy kimchi had with every meal.